Solid heavy base that keeps my Umbrella in place on a windy balcony. The Christopher Knight Home umbrella base ensures that your umbrella will remain securely intact with style and practicality. 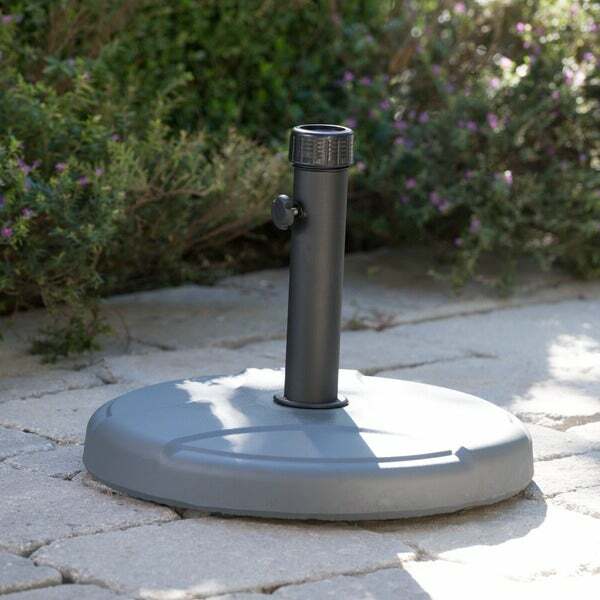 Built out of solid steel and concrete, the 55-pound base can accommodate an umbrella as large as 12 feet. The base rod features a tightening knob to easily secure almost any sized umbrella pole. Place one under your dining set to provide a shady and relaxing outdoor dining experience with your favorite outdoor umbrella. We have a very windy patio and needed something with lots of weight. Ordered this base and it did the trick. When not home, I do not have to worry about the umbrella toppling over. The grey color tone fits well with our other patio furniture. The base came well packaged and shipped quickly. I would recommend this product to friends. very pleased, in fact, I am ordering a second one today. We live in a high wind area and it will service it's purpose. Pleased with the grey color as well. We needed a very substantial base for a patio umbrella in a windy area, and that's just what we received. This unit came well packaged, was easy to assemble, and the neutral grey concrete material worked well on our walkway. Recommended. This base was very heavy and sturdy. I feel my umbrella will be safe and secure. Excellent product for the price and the weight is awesome for holding any size umbrella with or without a table. This base is HEAVY at 55 pounds! It won't tip over with our 9' umbrella in it. We will see how it holds up to higher winds. The only downside is that it's hard to relocate to another area of the yard. Great for a large umbrella (ours is 6.5 " by 10") and on a breezy, shore patio. This holds the umbrella firmly. Very nice. Holds the umbrella in place. Heavy enough to handle the wind outside. Very good purchase. Kept debating on the type of base to buy but I can see I made the right decision. Heavy, but sturdy. I don't think an umbrella will fly anywhere. This was quite heavy. As it is made of cement , it broke during delivery of course. But it was an easy return back to overstock, ups picked it up. This base arrived broken. It is extremely heavy. It is not really anything special to look at. I would not recommend this product. Overstock customer service was wonderful and refunded my money. Very sturdy and great price on sale! Very pleased with my purchase. It replaced the sand-type umbrella base and looks so classy compared to the hard plastic ones. Would definitely buy again. Plus the price was reasonable and the free shipping is a big plus. I like the fact that it is heavy. It keeps my market umbrella in place on windy days. I love it, it did not fit my umbrella but it is a great holder- very heavy! Great weight. Bear in mind that the pole is very short. "Will tis work with item# ITEM# 15118909? Tropi-shade 11" umbrella? It has a 2" pole." "Can this be used for an umbrella with a 2" pole? My new umbrella doesn't fit in my old stand." "When you will have stocks?" Hello xtrm111Joy, items are restocked as they become available; however, we cannot guarantee an item will be restocked. Thank you for shopping with us. "I see below in pole size(The base comes with two adapters which can accommodate a 38mm pole and a 48mm pole) a pole that is 1.375 inches 34.925mm will not work or tighten to secure ,am I correct...(TropiShade Patio Umbrella) specs?" Hello Flash, I hope your day is going well. The manual does say that it needs to be used for the listed sizes. Look at item 14117986 which will work for your 1 3/8 diameter umbrella pole. Thank you for shopping with us. "What is the total height, from bottom of base to top of tube?" Hello scottkeen, the overall height is approximately 14.50 inches. Thank you for shopping with us! "Made in U.S or china?" Hello Alejandro, the country of origin is China. Please let us know if you have additional questions. Thanks for shopping with us. Seemed like a good value for the price.